This page describes how to use the free modelling tool Blender to produce 3D models which look correct in realtime 3D software. Although the emphasis is on the VTP software built on OSG, most of these instructions are also relevant for other OSG users and even other 3D runtimes. There are lots of Blender tutorials which teach you how to build models and apply materials. However, they assume you will be rendering your scene inside Blender, using the non-realtime raytracer. Applying materials for realtime use is very different! Hence, this page. See the OB and ME? If the OB button is highlighted, it's showing you the material that's mapped to the Cube Object. 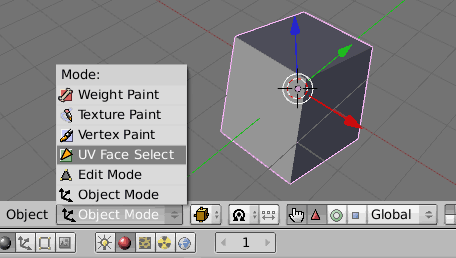 If the ME button is highlighted (as it is in the picture), it's showing you the material that's mapped to the Cube Mesh. This is an important distinction. You must map colored materials to the mesh (ME). Anything mapped to the object is ignored when you export your object. Making a textured object is surprisingly very different from a simple colored object. To start with, you do not make a material. Instead, you use a very different Blender method of applying a texture. If you want to change the texture image later, go back to UV Face Select mode and use the UV/Image Editor to open another image. If you don't see .osg listed on your File: Export menu, you can get it from the osgexport page. Unzip it into your .blender/scripts folder, and the next time you run Blender it should be there. Each of the three formats has pros and cons. Here are a few issues to consider with each format. It's a new and complex file format, so not much software supports it yet. Standard OSG 1.1 doesn't read it by default, but there is a Collada reader available as a separate project. It's an XML format, so the files are rather big. Naturally, it's OSG-specific, which is fine if OSG/VTP is your only destination. It's also quite a bulky text format, although you can use CManager (VTP) or osgconv (OSG) to convert your .osg to a smaller, binary .ive file. It's a simple, ancient format, fairly limited, but widely supported. 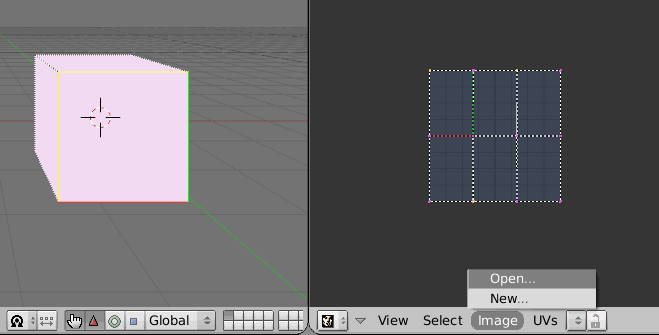 It doesn't support scene hierarchy, so all your coordinates will be "flattened" into a single space. Blender (in which the Z axis points up, or Z-up for short) writes OBJ files which are Z-up. OSG (by default) assumes .obj files are Y-up, so unless you take steps to deal with it, they will be turned 90 degrees. Blender was primarily designed for making detailed, non-realtime scenes, rendered with a raytracer. It has a different way of thinking about material properties and lights, which doesn't quite fit with OpenGL (and hence OSG/VTP). However, osgexport has some options you can set to compensate for the difference. When creating a material (for any normal colored surface - remember, textures don't use materials), in Blender's Material controls, set the color to 2/3 of the fully illuminated color you want. For example, if an object should be pure blue (0.0 0.0 1.0) on its lit surface, use (0.0 0.0 0.666). For those interested, here is an explanation of why the above values produce good results, and how ambient lighting works in OpenGL, and the VTP software in particular. Sometimes you get a whole model from someone else instead of creating a model from scratch. 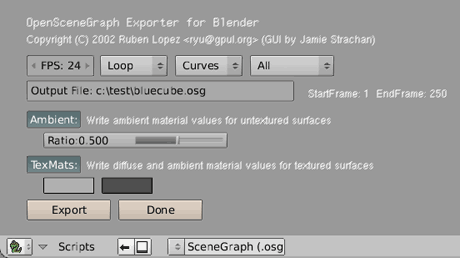 In that case, see How to fix Blender models for use with OSG/VTP.